Grease is a growing problem in cities across the country. It is now well documented that excess fats, oils, and grease discharged into the sewer system will eventually lead to expensive pipe blockages, waste over flow and failures at your waste water facilities. City officials, plumbing engineers, and end users all have a responsibility to provide the best possible grease management solution. Understanding everyone’s individual role is key in creating a comprehensive and effective program. Municipalities across the country look to start or improve existing grease ordinances to deal with the rising number of food establishments discharging fats, oils and grease into the city waste water system. With aging infrastructure systems handling our cities waste water, improving the quality of our pretreatment programs is an important first step. 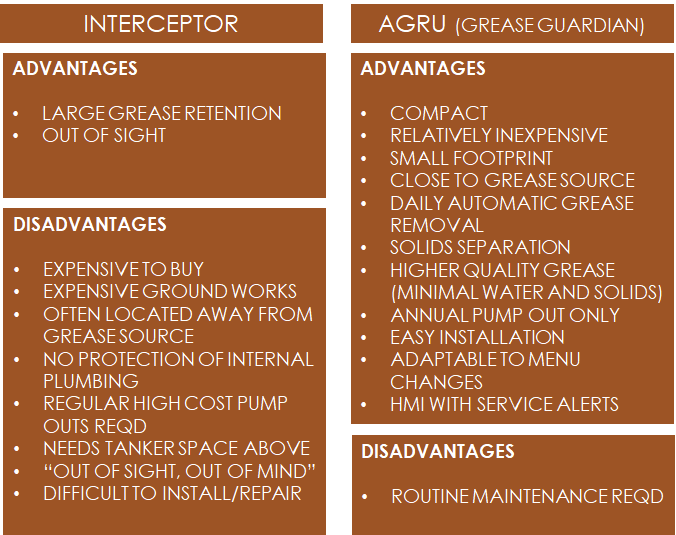 When starting your FOG pretreatment program, it is important to understand your grease interceptor options…. The equipment being used by your food establishments is one of the first lines of defense to keeping grease out of your public sewer system. Here are a few advantages and disadvantages to interceptors that are commonly used in the field today. Grease Guardian and our team across the country have the experience and expertise to help your program get off the ground. Educating municipalities and end users on the importance of grease removal is a large part of what we do! Call us today to learn more about your equipment options and hoe Grease Guardian can be a resource to your program!